The façade structure supports the Atlas Building. Therefore in the inside of the building there was no need for additional carrying columns. A true iconic building has to function properly, hence the four bridges crossing the Atlas Building's big interior void. The Atlas Building is meant as an office and investigation building for biological scientists. Vinoly tried to represent this fact in a remarkable daylight roof, reminiscent of old (modernist) industrial building roofs. The four bridges allow communication and interaction between different sections of the university. The Atlas Building is an educational building, located in Wageningen, Netherlands. It belongs to the Wageningen University and Research Centre (WUR) and is located in its Centrum de Born campus. The budget for the project was €11m. The building was designed by Rafael Viñoly Architects and Van de Oever Zaaijer & Partners. Visser & Smith Bouw was the main contractor for the project. Construction of the building was completed in 2006 and it was opened in April 2007. In 2007, the Atlas Building won the AIA New York State Award of Merit. It was also honoured with the 2008 International Architecture Award. WUR is one of the most prominent educational and research centres in the Netherlands. The institute focuses on plant, animal, food and environmental sciences. To promote its environmental research activities, an agricultural waste land was selected as the site for the Centrum de Born campus of the institute. "WUR is one of the most prominent educational and research centres in the Netherlands." The Atlas building is part of the Centrum de Born campus. The 11,000 square metre building is designed to serve as a sophisticated technological hub for research and educational facilities. It is the first building to appear from the entrance of the campus. The seven storey building houses the Alterra and the Environmental Sciences Group (ESG) and accommodates soil, water and climate research labs. The building also includes a restaurant, four cold storage rooms and cooled climate rooms. The design guideline was to construct a compact and visually appealing building with adjustable partitioning. The core aspect of the building is its spatial nature which is designed to be not only magnificent but simple and logical. The building provides plenty of walking space but minimises wastage areas. An open atrium with glass roof is provided at the interior central space of the building. This space connects to labs and commercial offices. There are 35 labs in the building along with their mechanicals. All floor heights of labs and offices are designed to be uniform and the floor plates are independent structures. The building relies on natural lighting which enters from the north side. User controlled lighting and temperature systems are implemented to achieve energy savings. The lab rooms are weather controlled and vibration sensitive equipments are used. The Atlas Building has been built as a flexible structure which will cater to the current and future needs of the WUR. 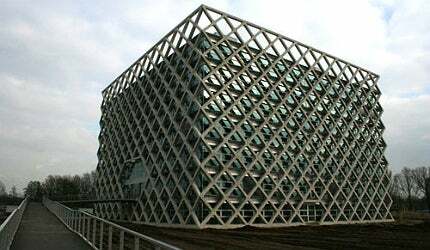 It has a cubical shape and has a concrete lattice façade which is the most striking element of the building. "The building is designed to serve as a sophisticated technological hub for research and educational facilities." The lattice façade, in a double lozenge form, is not only visually appealing but helps to support the entire structure. It includes a glass façade at the back of it. The prefabricated concrete elements of the lattice facade are placed at a distance of 70cm from the glass and aluminium wall. The facade resembles an exoskeleton and makes the building column free. It acts as a supporting structure for the floors and the glass wall. The sky open glass roof has two slopes of 600 at the top. As there are no columns, sunlight reaches the ground floor. Sunscreens provided with windows take of care of shading. The floors are made of THQ steel beams and are integrated into the floors, to make concrete and steel appear in a single plane. The beams are supported by the external concrete grid. Adviesbureau voor Bouwtechniek (ABT) was the project manager for the project. Wolter & Dros was responsible for mechanical works and ULC Groep was responsible for electrical works. Pieters Bouwtechniek was the structural engineer. MEP engineer was Schreuder Groep. B + B Landscape Architect was responsible for landscaping. Technological advancements have led to innovative designers incorporating immersive, interactive spaces into their designs. Architects continue to push the envelope by using glass in non-traditional ways, a trend which has seen glass change from a decorative to a flexible structural medium.